Glenn has always been interested in textiles, learning to knit at age five. 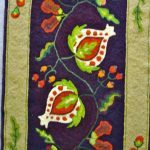 She hooked her first rug at age nineteen. She enrolled at the Ontario College of Art in the design department where she learned to weave. 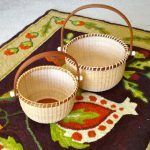 A five-year apprenticeship with a master basket maker rounded out her total involvement in the art of working in texture, design and colour.